Scientists and land-use managers have long recognized the importance of forest lands for their role in carbon uptake. Predominantly, research and international policy focus has been on tropical forests and habitats because of their rapid growth characteristics, which also make them susceptible to frequent harvesting. More recently, however, habitats that are able to stably take up and store carbon are being recognized as an important piece of the global carbon picture. There has also been greater research focus on cool-climate landscapes, such as those in boreal regions. With mature forests and temperature limiting the rate of decomposition in these regions, the potential impact of climate change in altering these landscapes has brought an increased effort to more fully understand them. Researchers from the University of Alaska Fairbanks, with funding support from the US Geological Survey, have instrumented three environmental monitoring sites within the Bonanza Creek Experimental Forest (part of the National Science Foundation’s Long-Term Ecological Research Network). The sites are situated across a chronosequence of permafrost degradation that is representative of key habitats of the terrestrial boreal landscape—habitats that are driven by differences in microclimate. The three sites include a black-spruce stand (which represents an area of stable permafrost with intact black-spruce forest), an active thermokarst site characterized by melting ground ice with underlying permafrost and considerable tree mortality, and a stable, treeless fen site with a deep active-layer depth. The project goal is to collect continuous year-round measurements of carbon, water, and energy fluxes, as they are the key linkages and feedbacks between the land surface, the atmosphere, and the oceans of the boreal climate system. To date, relatively few such studies have been undertaken in the arctic due to the harsh environmental conditions and difficult access to remote locations. 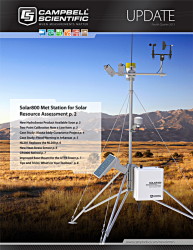 Continuous monitoring at locations with limited solar power availability in winter, where wind power is not a viable option, requires selecting robust sensors with extremely low power requirements, and remote system-diagnostic capabilities. 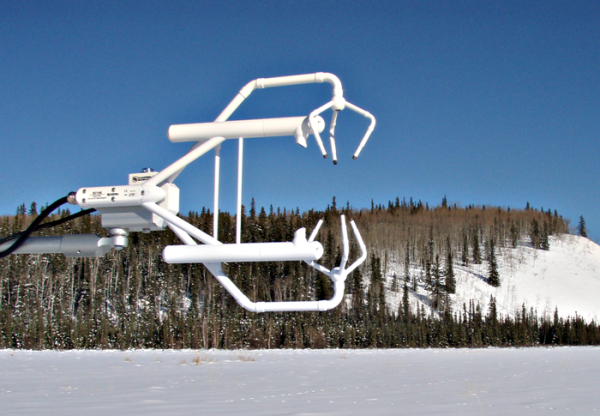 For the Bonanza Creek sites, Campbell Scientific’s EC150 open-path CO2/H2O analyzer with CSAT3A sonic anemometer and CR3000 datalogger was chosen for eddy-covariance flux measurements because of specific design elements that address many of these concerns. The very low power consumption of the EC150 proved especially beneficial over the winter months when solar power was limited. For these types of northern applications, periodic generator charges are often required during the darkest winter months. The EC150-based systems required only one generator charge throughout the winter, whereas the third site, which had a different CO2/H2O infrared gas analyzer, required three generator charges. Another advantage of using the EC150 on this project is the system’s self-regulating temperature control, which protects the inner parts of the analyzer in extreme cold while maximizing power-use efficiency. The EC150 also provides field-based CO2 zero/span capability using only the datalogger, which allows uninterrupted monitoring, even in this very remote Alaska location. Data collected from the Bonanza Creek sites includes fluxes of atmospheric carbon dioxide, water vapor, surface energy, photosynthetically active radiation, air and soil temperatures, rainfall, snow depth, soil moisture content, wind direction and speed, and average atmospheric concentrations of CO2 and H2O throughout the year. These data sets will help improve models of present carbon fluxes and guide predictions of how these processes are changing as the regional and global climates shift.